When I hear the phrase classroom management, I often think about how a teacher might handle an off-task student or a school wide behavior pyramid. However, more often than not, classroom management boils down to the systems in place that encourage students to be on-task and engaged in their learning. 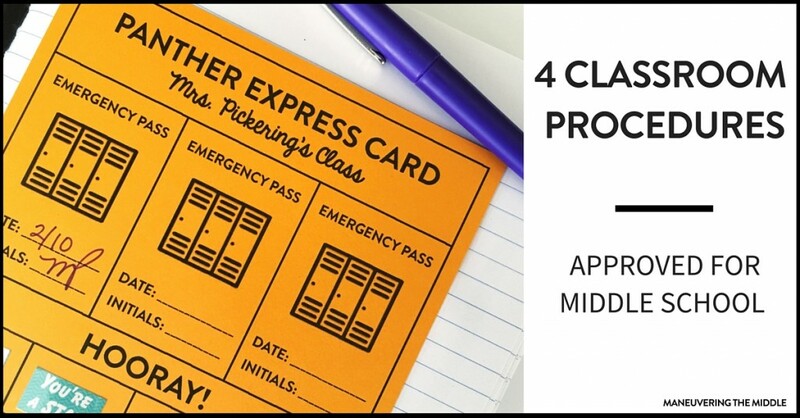 Today, I am sharing 4 Helpful Classroom Procedures for Middle School. 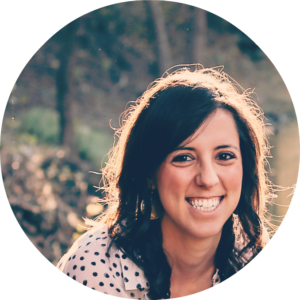 Easy tips and tricks you can begin implementing tomorrow, including a free printable. I think we can all recall a procedure or system that lends itself to trouble. My first year, it was the overabundance of papers. Students would ask where the late work went, if they had a missing grade, there would be a congregation of students at the turn in tray, and I couldn’t get class started on time. I didn’t have a procedure and over time it became a management issue. I think one of the most common questions, as well as possibly the most irritating is the bathroom/locker request. Inevitably you call on a student who you think is going to answer the question or ask a content question and they ask to go to the bathroom. Maybe you hand out bathroom passes at the beginning of the grading period and yet when a student hands one to you, you don’t have a place to put it, your pocket is available and then amazingly enough you find a tattered pass in your laundry. Maybe that was just me. This was even mentioned in our Teachers Around the Globe interview with Mrs. Brack. 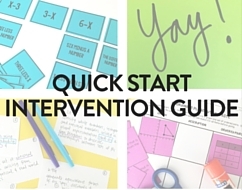 If you use interactive notebooks or even binders, I have a solution for you. 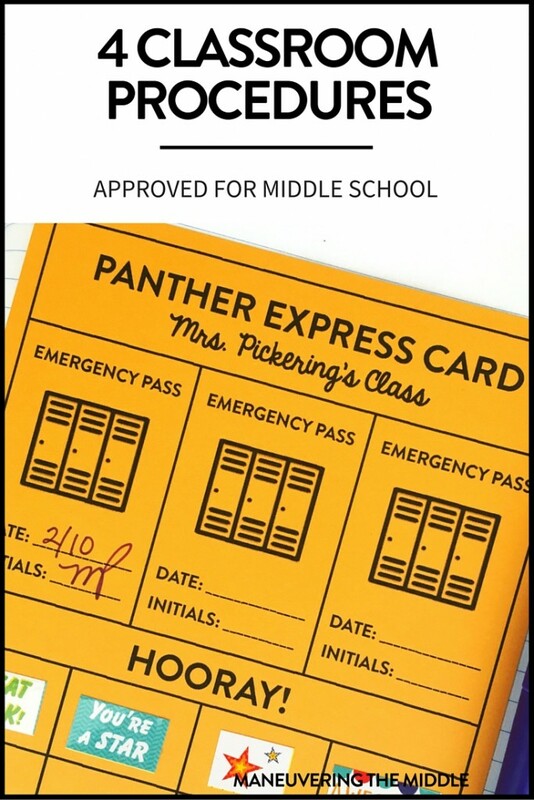 It works not only as a procedure for bathroom and locker requests, but also as a reinforcement of positive behavior. This has been quite popular of an idea, so I have created a template, ready to customize. Simply, download the file, save it to your computer, type in the blanks, and print. It has been formatted two to a page, which is perfect for interactive notebooks. I recommend printing it on colored card stock, so that it is sturdier. Depending on how gracious you choose to be, this card could last a grading period or a semester. I preferred one per semester. 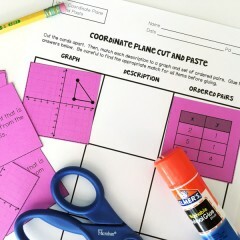 Students would glue it into the very first page of their interactive notebooks. 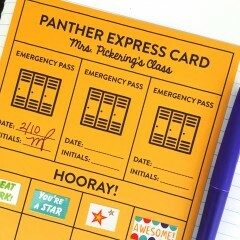 If they needed to use an emergency pass, they simply turned to their front page and waited for me to come around during the lesson. 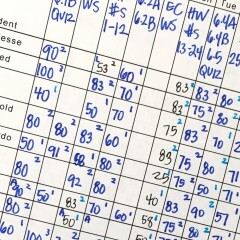 For me, this was acceptable during classwork, group work, or independent work time. I did not accept this during any direct instruction. I would initial and date the pass and didn’t have to collect it or keep track of how many they had used. I will note that some of your more “creative” students might try and borrow another students’ notebook. Either have students write their name on the pass or just confirm that the notebook is actually theirs. How can it be used for positive reinforcement? There are certain procedures that take an extra amount of time and energy to teach. 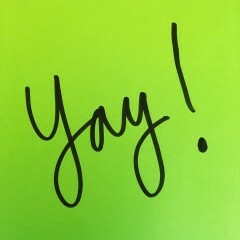 As I worked through those procedures, I would either sign, stamp, or give stickers in the Hooray section to those meeting the expectation. Honestly, middle school students still love recognition like this and it is an easy way to offer positive reinforcement. Click here to grab the free editable template. I saw this on pinterest several years ago and have appreciated it everyday of my teaching career. It is as simple as painters tape, a sharpie, and a table or cubby and five minutes of time. Determine what supplies you will keep accessible at any time. For me this included a classroom hole punch, a classroom stapler, and a box of kleenex. These three things were always available to students. Somehow, they have a tendency to go missing, the kleenex box is no where to be found, I use the stapler and leave it on my desk, etc. Naturally, it is because they didn’t have a home. Take a piece of painters tape and label the name of the supply, then place that on a table where all have access to it. 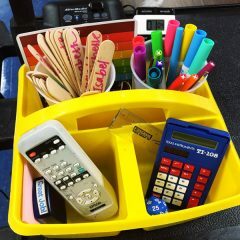 This creates a home for the supplies and students know exactly were to return it. If it all possible, move your pencil sharpener to the back of the room. It will cause less distractions and reasons for a student to need to sharpen their pencil. Don’t have a plug close by? Get an extension cord. Have a manual one? Order a new one on Amazon and then put in a maintenance request or bring a drill to school. I had this added to the side of a cabinet in the back of my room. Well worth the $10.00 and time. I honestly believe the first 3 minutes of class, set the stage for the day. If things are calm, students are working, then you feel confident prepared and excited to begin the lesson. If it is hectic, students are up and moving, talking, or unsure of what to do, you feel frazzled, annoyed, and frustrated. The best thing I did for these first few minutes was have the same type of warm up or bell ringer each day. Students knew what to expect and how to get started. I spent several weeks teaching students what it should look like when the bell rang, positively reinforcing it (as seen above), and providing consistency each and everyday. 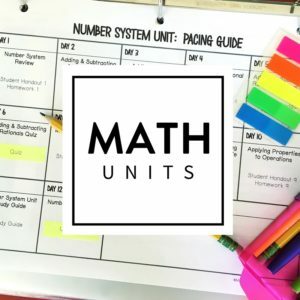 I wrote more about it in my Strategic Math Review post, so be sure to read about how I did it and how you can replicate the process using my Daily Math Warm Ups. 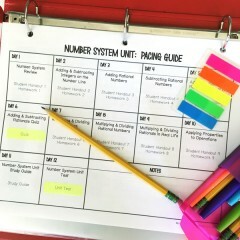 These 4 Classroom Procedures for Middle School are a great start to get organized both for yourself and your students. 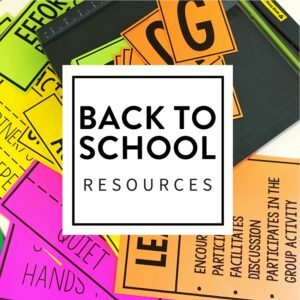 I hope this post provides some ideas that could be easily implemented in your classroom. Thank you so much! I adore this pass. I teach at an English academy in S. Korea and I have the exact same problem with kids wanting to go to the bathroom all the time. This seems like a great way to solve this problem for my classes. Again, thank you!! Wow, its so cool how the internet connects teachers from all over the globe. I am glad you like it! Hope you have a great year! Hi, I’ve been searching your blog looking for your explanation of how you use your “Pay Day” classroom economy. Is there a link I could follow that would give me more information on that. 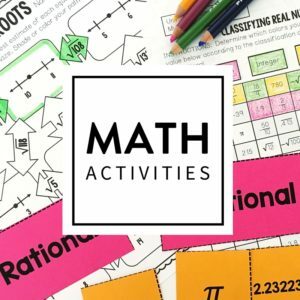 I am a early elementary teacher who is moving up to 6th grade and looking for a more mature behavior management system. I don’t have a post at this time, but it is on my list. Thanks!